CIMA is pleased to release a special report, Making Media Development More Effective, by Tara Susman-Peña, a media development and communications consultant. She was the director of research for Internews’s Media Map Project, which informed this paper. A wealth of research demonstrates that a healthy media sector is consistently paired with better development outcomes and can contribute to better development. However, media development–donor support for strengthening the quality, independence, and sustainability of the news media–has comprised only about 0.5 percent of overall aid to developing countries. 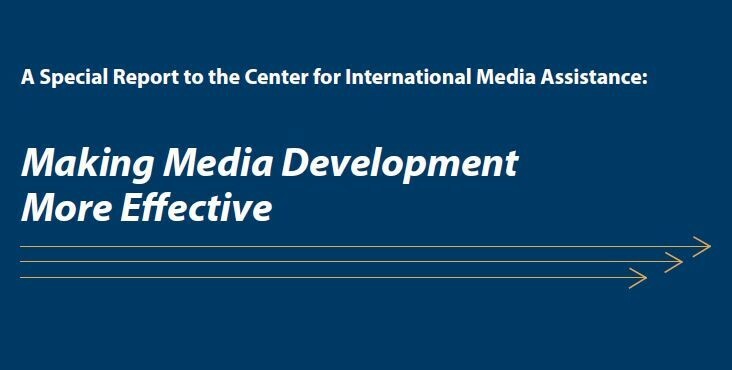 Should media development’s track record earn it a more central place in international development? A strong evidence base of original research conducted for the Media Map Project, a collaborative effort between Internews and the World Bank Institute, funded by the Bill & Melinda Gates Foundation, provides the opportunity to analyze the extent to which donor support to media has helped the media sector fulfill its promise to strengthen development. This report points out that donors to media development have a number of blind spots that prevent their interventions from being more effective and that media development stakeholders could improve their efforts by applying aid effectiveness principles to their practice.